Lack of winter maintenance on existing multi-use trails was one of the concerns expressed at the Trails Plan open house. 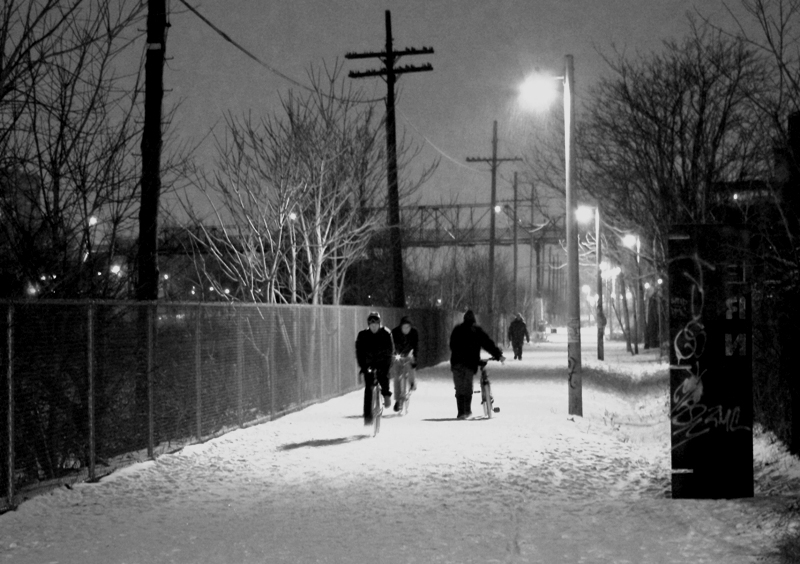 Photo of cyclists on the West Toronto Railpath by Martin Reis. Update: Transportation Services Cycling Infrastructure and Programs staff have released the maps on display at this public meeting. The Proposed New Connections Map (PDF) and the Proposed Trail Upgrades and 2012 Trail Upgrades Map (PDF). Approximately 100 people filtered through a meeting room door on the second floor of Northern District Public Library to have their say about the City of Toronto's updated Trails Plan on Monday, February 6, 2012. Included as part the Mayor's Bike Plan, the Trails Plan aims to improve existing multi-use trails across the city as well as add 100 km of new off-road trails. About 30 km of new off-road multi-use trails are close to completion. These trails were approved in 2009, prior to the current mayor's election, and are funded as part of the Recreational Infrastructure Canada Program in Ontario (RInC). 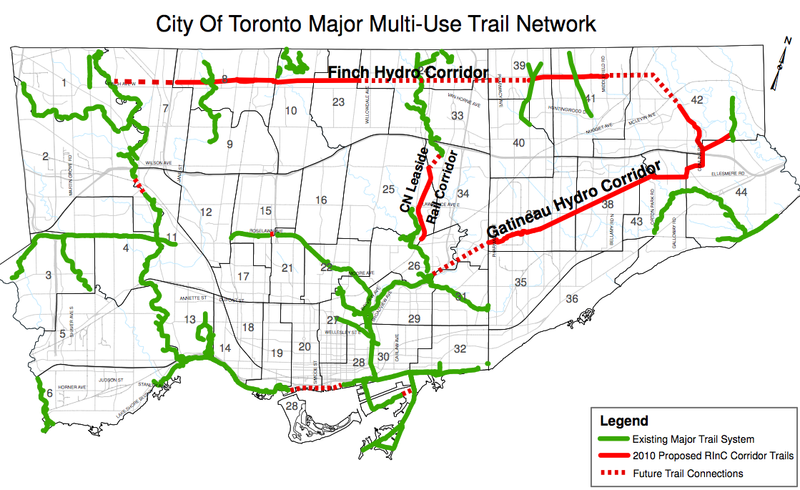 These trails include the Finch Hydro Corridor and CN Leaside trails (for a full list of RInC projects in Toronto see here). Map of RInC trail projects. At the Trails Plan open house, two large maps were spread out on tables dividing the proposed projects into two parts. One map featured the locations of state of good repair updates proposed for existing trails and a second map listed the 29 proposed new trail connections. Transportation Services staff from the cycling infrastructure and programs unit circled about the room, encouraging participants to attach notes to the maps with their concerns, and answering questions about the plans. Many of the attendees presented very specific requests for upgrades and repairs such as improving access to the Don Trail and adding road markings where the Eglinton West trail crosses through intersections. From flooded trails to unclear wayfinding signs, the group that gathered around the state of good repair proposal map shared many stories about the frustration of navigating the current trail system by bicycle. But there was a decided emphasis on connectivity between off-road and on-street bike infrastructure overall. At the proposed trail connections map, guests were encouraged to rank the importance of the proposed new connection projects. It was here that it became clear that many attendees were interested in the recreational trail projects that could also benefit bicycle commuters. The projects that quickly received stickers indicating top priority included the West Toronto Railpath extensions both north and south, a trail along the Ward 17 Hydro Corridor and connecting the Martin Goodman Trail along Queen's Quay. Conversations around both maps continuously brought up the lack of connection between trails and on-street routes. Families wishing to cycle from their homes to the paths often must take convoluted side-street routes or face high-speed traffic on multi-lane roads. Many of the participants at this open house were there to strongly recommend that continuous routes be created that include both on-street lanes and off-road trails. City staffer Jennifer Hyland explained that the Trail Plan is currently a "living document." Each proposed project is still in the early planning phase and the community and stakeholder input obtained at similar meetings will help shape the priorities and eventual outcome of the Trails Plan. This meeting's comments collected by staff will be combined with those from previous consultations with the Toronto and Region Conservation Authority (TRCA), Toronto Parks, Forestry and Recreation, Hydro One, Toronto Water and a number of other stakeholders. The resulting report will include greater details about the proposed connections and current state of good repair recommendations for existing multi-use trails. The report will be made public upon release to the Public Works and Infrastructure Committee on March 21, 2012. Be sure to also write your councillor to let them know you support off-road trails expansion and enhancement in your area but that you need to be able to get to them safely too! dandyhorse will continue to follow the developments of the Trails Plan and will be looking in more detail at the current trails network over the next few months.